The scent of sauerkraut will be in the air next Wednesday when the Wishek Association of Commerce hosts the 93rd Annual Sauerkraut Day festival in Wishek, ND. The city of Wishek is situated 30 miles east of the Missouri River on Highway 13 in south-central North Dakota, about 50 miles south of Interstate 94 and 30 miles north of the South Dakota border. While it is a rural, farming community that long-time resident and retired school principal Cleo Boschee says is, “a hundred miles from everywhere,” Wishek is not your typical small town. Many small towns seem to be dying, but Boschee says Wishek is holding its own. The community boasts two implement dealerships, two new car dealerships, plentiful wildlife bringing hunters from all around, a grocery store that ships its sausage all over the country, and of course…Sauerkraut Day. 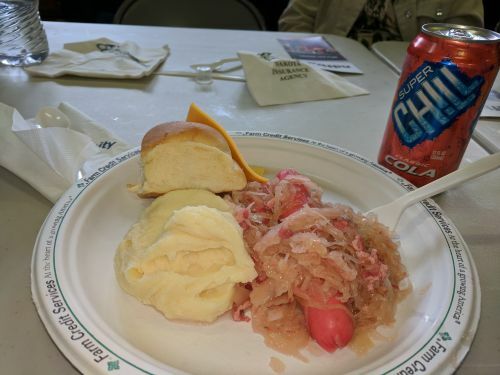 For the past 93 years, on the second Wednesday of October, the Wishek Association of Commerce – along with help from local businesses and residents – has sponsored Sauerkraut Day. It is a time for community businesses to show their appreciation to customers by providing a free meal and entertainment. Boschee, who serves as an emcee for the event, says the early years of Sauerkraut day saw the meal served out of a window at city hall to folks who would come into town with a team of horses. Customer appreciation was always the focus of the event. Businesses would bring people in by offering the free meal, but they would also use the influx as an opportunity to make a few sales as well. “All the business places had specials,” says Boschee. Some of the specials, which he found on a print from that time, included $0.15 fence posts and tires for a couple dollars each. Today, Sauerkraut Day isn’t just a meal, it is a full day event that draws about 1,500 people from the local area as well as greater North Dakota and beyond. That may not seem impressive at first glance, but when you consider the population of Wishek is just under 1,000 residents, it is very impressive. Boschee says folks come from as far as Canada. In fact, last year he and his wife hosted couples from both Wisconsin and Canada. Since this is an election year, Sauerkraut Day wouldn’t be complete without a few dignitary sightings. Boschee says he expects political candidates from across the state to show up this year. The candidates aren’t allowed to do any political speeches, but they do get some exposure by introducing themselves and telling what office they are running for. In the past, those running for seats in Washington, D.C. have also been in attendance. This year should be no different. While it isn’t confirmed, Boschee is fairly certain this year’s U.S. Senate candidates will show up. “Cramer and Heitkamp will probably both be here,” he says. Sauerkraut Day begins with a vendor show that opens at 9:30 a.m. and lasts until 4:30 p.m. at the National Guard Armory on the east end of town north of the school. The vendor show includes locally produced goods including food such as strudels and kuchen, crafts, rugs, and has included health screenings in years past. Dani Goebel, a member of the Wishek Association of Commerce says she believes they are at max capacity for vendors with 21 registered to be on hand. The meal, served at the Civic Center, starts at 11:00 a.m. and lasts until 1:00 p.m. Attendees should expect a line. Last year, it stretched from inside the Civic Center on the south end of the building, across the to the north end, out the door, and back around to the street on the south end. However, the wait is worthwhile. The meal is sauerkraut, wieners, speck, mashed potatoes, cheese, buns, coffee, and water. To prepare to feed 1,500 people, cooks use 125 gallons of sauerkraut and 500 pounds of wieners mixed with speck, which is fat, in vats big enough for a full-grown adult to crawl inside and take a bath in. Goebel says the stirring needs to be done with pitch forks. The job is so big it needs to be done off-site. All the food comes from Stan’s SuperValu, the local grocery store. Altogether, Boschee figures it takes 50-100 people to make Sauerkraut Day a success. This includes volunteers from local businesses, the Lions Club, and residents like Pat Wanner who leads the cooking efforts. For years prior to Pat’s time as lead cook, his father, Leroy did the honors. Boschee says that after all these years, everyone just knows their role and the entire operation always runs smoothly. The consistency and commitment by younger generations has been a key to success. The entertainment begins at 11:00 a.m. as well. The lineup always includes music by the Wishek Public School’s band and choir. Janet Wolff, the music teacher directs the students as they play instruments like the accordion and sing German songs. After the students perform, the entertainment continues. This year, the Bismarck Rock’n Cloggers will perform clog dancing. Bingo begins at 2:30 in the Civic Center. Boschee says the jackpot this year will be $900. Goebel says the school, hospital, and nursing home will also serve the Sauerkraut Day meal. So, even though the meal takes place on a Wednesday, when kids will be in school, the students in town will be able to get a taste. There are also other events taking place during Sauerkraut Day, although they are not part of the event sponsored by the Association of Commerce. One is the pie social across the street from the Civic Center at First Baptist Church. Garage sales have also taken place around Wishek in the past. Wishek is 170 miles from Fargo, but worth the drive. The town has plenty to offer and the event is one of a kind. After all these years Boschee still loves Sauerkraut Day. “It’s great. I enjoy it. I have a good time,” he says. Wednesday, October 10, 11 a.m. – 1 p.m.